The Reception of Laurence Sterne in Europe, Ed. by Peter de Voogd and‎ John Neubauer, Bloomsbury Academic, 2008. The intellectual scope and cultural impact of British writers in Europe cannot be assessed without reference to their 'European' fortunes. 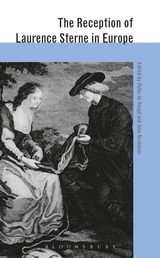 This collection of 14 essays, prepared by an international team of scholars, critics and translators, records how Sterne's work has been received, translated and imitated in most European countries with great success. Among the topics discussed in this volume are questions arising from the serial nature of much of Sterne's writings and the various ways in which translators across Europe coped with the specific problems that the witty and ingenious Sternean text poses. "It is a tribute to the fascinating material to be found throughout this volume that one often wishes the book were longer...As should be clear, his volume is a gold-mine of information and a treasury of affectionate readings and creative misreadings of Laurence Sterne, often made in difficult political or personal circumstances, as well as a work of enormous value to a range of readers — not only Sterneans or those interested in the reception of British authors in Europe but also, for example, those concerned with translation per se."